Villa Natha is a 5 bedroom modern, airy and open sea view property with increible views throughout and fun infinity pool. This stunning hillside villa is set into lush greenery and overlooks Choeng Mon, one of the most beautiful views on the island. Plenty of features include a private gym, infinity swimming pool, indoor cinema room and poolside barbecue. Ample space on the pool deck overlooking far off islands is complete with sun-soaked pool loungers with plenty of room to stretch out and enjoy a perfect island day. 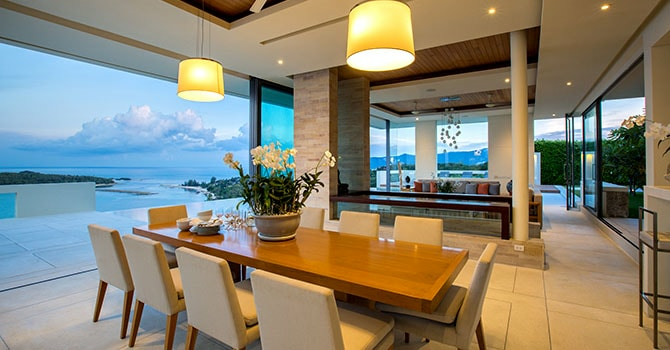 Multiple indoor/outdoor living and dining areas make this villa a great entertaining space. 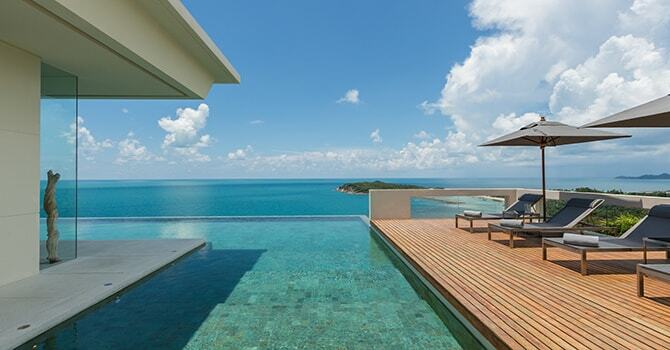 The villa enjoys a spectacular location overlooking the glorious Choeng Mon Beach area. Although it is a peaceful and relaxing setting, bustling Chaweng is just ten minutes away, as is the airport. Each of the villa’s maximum of five bedrooms are light and airy, with large windows to make the most of the stunning views. There are three bedrooms with king-size beds and large modern ensuites, while two further rooms have comfortable queen beds and their own spacious ensuites for privacy and comfort. "A wonderful and unforgettable stay" We spent 15 days with family in this splendid and spacious villa. Everything is furnished with taste and refinement. 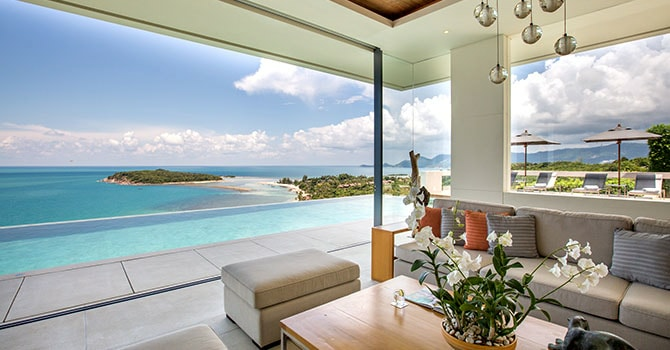 The rooms are spacious and all overlook the sea. The view is splendid. Every morning we did yoga and then a delicious lunch was served. We chose to have a cook in the villa and it was magical. Fine and refined cuisine. The staff was incredibly kind. At the same time discreet and attentive to all our needs. We had an unforgettable and wonderful stay. We thank the owner and all his excellent team. We will return very soon.